Myth: "More megapixels equals higher quality"
The larger the digital camera megapixel number, the better the camera and digital camera and images, right? The answer may surprise you, but from my personal experience, the answer is a resounding NO! A digital camera with a higher megapixels number may be better than a lower megapixel camera, but it does not mean that it must be better. Kodak DC265 (1.5MP): I purchased the Kodak DC265 in 1999. At the time, the DC265 was considered a semi-pro 1.5 MP digital camera. It took really fantastic digital pictures. Ultra clear pictures with great color reproduction and a great flash (the flash is better than most digital camera's even today). The only thing I did not like about this camera was the shutter lag. You would press the shutter button, wait, wait, wait, and then click - picture taken. I started to see 4MP cameras come onto the market, and was about to go on a family vacation in 2003. Someone recommended the Casio Exilim to me, so I gave it a try. Casio Exilim 4 (4MP): I tried out the Exilim camera and I was initially impressed. However, I was quickly disappointed once I examined the pictures taken by the camera. Quality overall was very poor (compared to the Kodak DC265). There was color fringing all over the picture and there was significant blurring around the edges of pictures. To test image detail, I set up a side by side test between the new Casio and my old Kodak photographing a car at a distance and then attempting to read the license plate (both camera framing the scene the same). 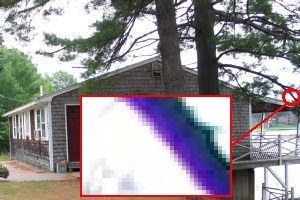 Looking at both photographs magnified in the computer indicated that the 4MP Casio camera was no better than the Kodak 1.5MP camera at resolving detail. But how was that possible? The bottom line was simple -- the Casio had more megapixels, but the optics were much poorer -- resulting in pictures that we not even a good (both color wise and quality) as the old 1.5 MP Kodak DC265. When 5MP cameras became widely available in 2004, I decided to once again look for a replacement for my aging DC265. A panorama web site highly recommended the Canon G5. Canon G5 (5MP): When I tried the 5MP Canon G5, I found that it had a huge 'blue cast' (Chromatic Aberration) problem -- so bad, in fact, that I wrote an article on the subject. A quick search on the Internet turned up a lot of information on this known problem with the camera. Even more frustrating was Canon's ridiculous reply to my technical support question on the 'blue cast' problem -- which turned me off to Canon as a company. Once again, the quality of the optics was the issue. Enough was enough. After searching the internet, I found the Digital Photography Review (dpreview.com) web site, which appeared to be an independent review of many high-end digital cameras. I finally settled upon a DSLR (digital SLR), the Nikon D70, which the site 'highly recommended', even when compared to other digital cameras. Nikon D70 (6MP): This camera is nothing short of amazing. The quality of images is outstanding. The speed is really fast -- instant 'on' and effectively no 'shutter lag'. When you turn the camera on, it is on - there is no waiting. When you press the shutter button, there is no waiting - it takes the picture just like a SLR. The flash is OK -- not as good as my old Kodak DC265, but the external flash makes up for that. Over 1000+ shots in a single battery charge. I can't say enough good things about this DSLR. And when you look at the camera, the size of the glass/optics in the lens, I think says it all -- and why cameras with lenses a fraction of the size can not compare. The bottom line: The bottom line is that the number of megapixels, while sometimes initially impressive, is nothing compared to quality optics. Avoid cameras with cheap optics. Examine the pictures you take with any new digital camera and review them in the computer (blown up) with a critical eye. If you can, stick with a good digital SLR instead of a compact digital camera. And while the tradeoff of a DSLR is increased size, the quality optics results in quality images that very few, if any, compact digital cameras can match.